Anyone campaigning against Narconon - please note signing a petition is not enough - 1000 signatures only equal 1 objection. Every objector needs to object in writing per person. Submissions must be in writing. At our meeting of objectors on August 22, 2013, Council advised they would keep accepting submissions until the matter is decided by a meeting of councillors. Check with your local council. Object on LOSS OF AMENITY, TRAFFIC, IMPACT ON LOCAL PRIMARY SCHOOL - see templates and personalising opetions below. Objections for this campaign - which numbered 300 - have now closed. Make a copy of your letter or email, the date it was sent and specifically ask for a receipt for your submission. Keep notes to prove what and when you send your submission. Think about impact on amenity of your local area. Amenity includes any feature, benefit or advantage of the local environment which people currently enjoy. Any effect on views, noise, traffic (it's not just an unsuitable road ...it's a shared driveway!) and general atmosphere is relevant. Think about perceptions of safety or widely held views about a facilities use as a drug and alcohol rehabilitation centre and how that use will affect you. Template: Print our simple PDF templates below. Print, date and enter your details and send. Personalise your submission, use SAFETY, AMENITY, SCHOOL PARENT or PROPERTY OWNER pages to copy, paste your own objection. OR contact us for assistance or if you believe you have a new, relevant objection that might help others. Keep a copy! Some Yarra Ranges correspondence seems to be getting 'lost in the mail'. If you are a property owner near Green Gables, stand up for the value of your property! If you are a parent of a child at Warburton Primary School, stand up for the future of your school! Already we have lost one family who gave notice at their property and are leaving. How many more? Object on loss of amenity in your community. Bringing drug addicts - some diverted direct from jail - into residential Warburton is a recipe for disaster. 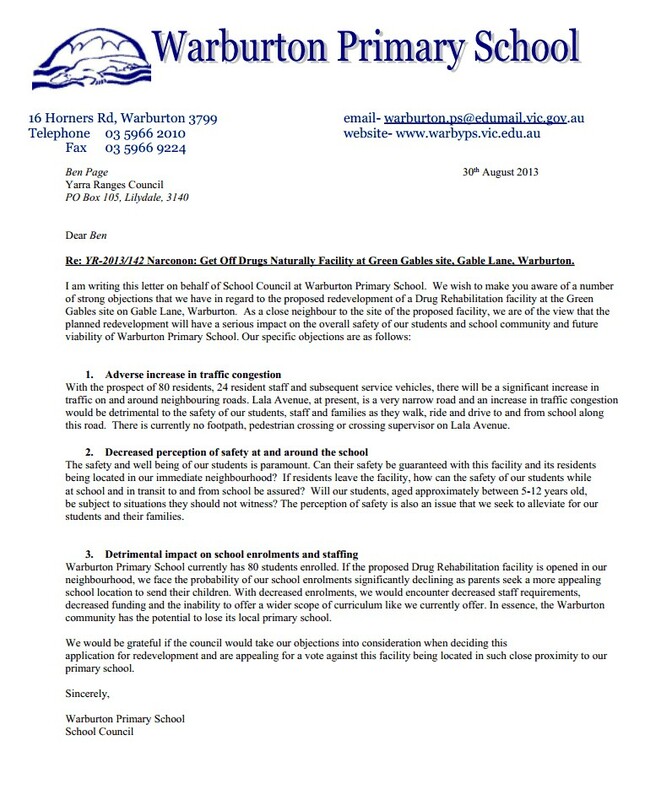 The letter detailing the three main objections of the Warburton Primary School Council. This letter has been approved by ALL council members.